Analysis | Technology | FUJICOPIAN CO., LTD. This is the basis of Fujicopian's philosophy. Due to the pressing necessity of knowing the characteristic values of materials at the product development site, many analysis and measurement tools are heavily utilized at our company. No problem presents itself with measurement that can be done with general measurement tools, but property values that exceed those limits are sometimes necessary. We have developed original measurement tools for these situations that measure property values at a higher dimension. These original measurement tools developed by our company are also being sold and they are being used in research centres at various companies. 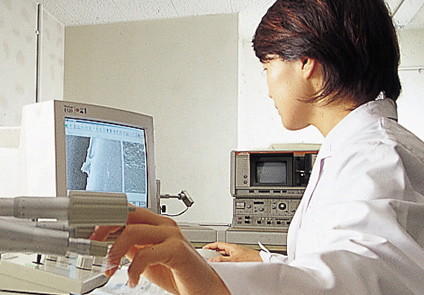 The behaviour of Fujicopian products when heat and pressure are applied is often a focus point for measurement, and valid data is gathered using our original measurement tools. Static and dynamic friction characteristics of pressure, speed, and temperature are measured at normal use conditions.